Enhancing knowledge and skills in water movement and management solutions. To ensure that our end-users are receiving the most out of their water movement and management systems, we continue to invest a large amount of resources towards continued education via hands-on training. We look forward to each opportunity to educate our present and future customers about on-going advances in various pumping, mechanical and control technology. Our training instructors are dedicated to providing in-depth courses designed to introduce new technologies and prepare attendees for safe and effective field work. It is our hope and commitment that such education provides added opportunities for our customers to provide exemplary service to their end-users. Our seminars, many of which satisfy state requirements for continued education, are hosted on-site at our company headquarters in Romeoville, IL. In addition to our in-depth training, attendees have the opportunity to tour our production facility to help gain a more hands-on demonstration of Metropolitan’s various products and services that can be applied to their line of work. And of course, our seminars include complimentary lunch or dinner. Note: Spring 2018 seminar dates are being finalized and will be posted soon. Users may register for their specific course directly online or by giving us a call at 815-886-9200. We will also be happy to answer any additional questions that you may have that pertain to course information, scheduling or accreditation. This class includes a discussion on commercial and residential plumbing pump applications including sewage and stormwater pump systems, lift stations, booster systems and a discussion on pressure reducing valves. This class satisfies the ILDPH (Illinois Department of Public Health) certification requirement. This class is designed for municipalities and engineers covering submersible pump station design including hydraulic calculations, pump selection, theories of operation, electrical and mechanical considerations, and live demonstrations on controls and instrumentation including installation recommendations. This class satisfies the IEPA (Illinois Environmental Protection Agency) certification requirement. This class is designed for municipalities covering pump station theories of operation, control panel considerations, communications, instrumentation, and SCADA implementation in a municipal water, water treatment, collections, and wastewater treatment system. This class satisfies the IEPA (Illinois Department of Public Health) certification requirement. This class includes a hands-on demonstration on pressure reducing valves, servicing and repair. This class includes a hands-on demonstration on pressure reducing valves, servicing and repair and will present a design review of the various types of temperature control devices for domestic hot water distribution systems including mechanical and electronic solutions. This class will present a design review of the various types of temperature control devices for domestic hot water distribution systems including mechanical and electronic solutions. Can't Make One of the Scheduled Seminars Above? Not a problem! Let Metropolitan come to you! Coordinating crew or staff members is a common challenge within municipalities and organizations. That is why Metropolitan has introduced our Mobile Showroom, where we take our custom design and innovative solution expertise on the road and straight to your facility! 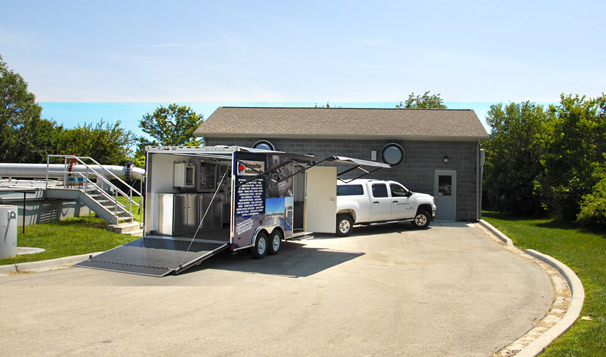 Our Mobile Showroom display trailer is best described as a trade show on wheels featuring the latest technology and innovative solutions from Metropolitan Industries! These visits also provide the opportunity for your employees to earn continuing education hours. For more information or to schedule your visit, please contact our customer service team. We are ready to answer any questions pertaining to our seminars, including additional course information and scheduling.